The Alkal-Life is U.S.F.D.A. Medical Device #300505378. The 7000SL is the newly upgraded model from the 3000SL. Hydration is important to normal body functions. Our bodies, each day, must assimilate adequate "quality" water, water that is like water found in nature-- clean and full of "stable" oxygen, alkalinity, and high in negative ions. Estimates are that 70% of us are dehydrated and chronic dehydration and over acidity are largely responsible for the degeneration of our body including the organs and brain that have a high water content. Some believe that Dementia and Alzheimers are examples of a dehydrated brain. 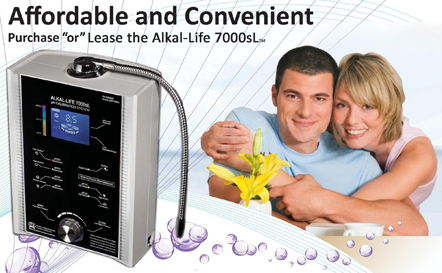 Alkaline water helps keep a healthy human pH at approximately 7.365, and acidity brings symptoms as pain, arthritis, lumbago, osteoporosis, high or low blood pressure, obesity, low energy, depression,which can easily build up and create more acidity and degenerative diseases such as chronic arthritis, diabetes and cancer can occur. "Alkalinity" subdues and detoxifies acidic wastes/toxins and projects them out of the body. ( Dr. Otto Warburg in 1931 showed oxygen destroys cancer cells--he won the 1931 Nobel Prize for this discovery ). Alkaline water helps destroy and prevent cancer. Bacteria, fungi, and parasites thrive in an acidic environment and they expel waste into our bloodstream. A "healthy" pH is essential to our human system for ongoing and balanced health and wellness. We have both acid and alkaline existing in our body. A proper Alkaline pH deters bacteria, inflammation and disease. The pH balance is so important that when no more calcium is available our body leeches it from our bones ( explaining why arthritis and osteoporosis are so common ). 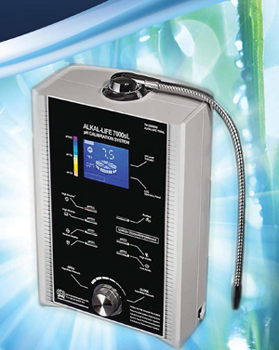 Heat, Rash, Eczema and Burns: Acid water has superior disinfectant qualities. Dip the affected area in acidic water, or apply acidic water to the affected area for relief. Washing / Bathing / Shampoo: Acidic water softens and adds elasticity to skin and hair. It's astringent quality helps prevent acne, age spots and freckles. 1. Alkaline water is a powerful liquid anti-oxidant that is easily absorbed into the body and neutralizes free radicals. 2. Alkaline water has ions (lots of them) to balance and maintain a proper body pH (6.9-7.2). This creates an environment that inhibits bacteria, inflammation and disease. 3. Alkaline water has a smaller molecule structure. This facilitates more hydration, faster nutritional intake and better detoxification.